As the month nears its end, I feel like there are a lot of things to catch up on. All these little bloggable odds and ends that, thanks to a busy schedule and pneumonia, I fell behind on sharing with you. First off, I baked a really nice loaf of sandwich bread. This one was made with some dried milk, an ingredient I was surprised to find in my local market. 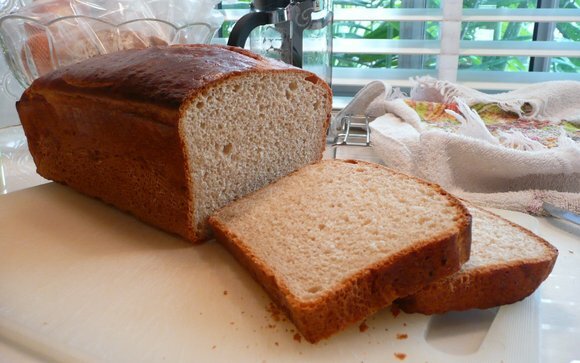 It makes a really nice texture for sandwiches, even though I usually prefer a more rustic loaf. A few months ago, in an attempt to make the Annex more comfortable as a living space, we purchased a TV and then a DVD player. Since our DVD collection spans the globe, we needed a DVD player that can play discs from all regional zones. The initial one we purchased, despite the salesman’s promises, couldn’t. When we brought it back to the store for him to unlock it, we discovered that something else was wrong and it wasn’t playing any discs at all! He gave us the display model as a loaner while he ordered a replacement. A few weeks later he said the new DVD player had arrived so I brought the display model in for a swap. In what has to be the perfect example of Thai problem solving, the salesman used a hair dryer (from a display in the store, nonetheless) to carefully remove the manufacturer’s label on the display model and on the newly ordered DVD player. He then swapped the labels so I went home with the new DVD player that had the display model’s label and serial number on it. He then shipped back the display model with the new player’s label on it back to the manufacturer. You following this? Kind of crazy, huh? I least I now have a DVD player that works and can play discs from all regional zones. 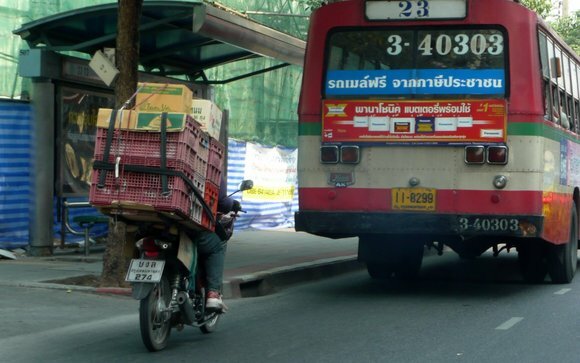 This week’s entry in the motorbike category is shown above, with no less than six milk crates and two additional boxes strapped onto the back of his bike. I can only imagine how poorly this bike handles with such a high center of gravity. In the truck category we have this pickup truck which is overloaded in such a silly manner, it ceases to be funny. What is in the boxes? Lay’s potato chips. So the truck isn’t overloaded by weight, necessarily, just size. December 5th was His Majesty the King’s 82nd birthday. Yellow is the color normally associated with His Majesty, as he was born on a Monday, the day associated with the color yellow. However, in the recent political tumult in Thailand, the royalists appropriated yellow and are now known as the “yellow shirts.” Because of this, yellow is too partisan a color to wear to celebrate the King’s birthday. It seems that this year, pink was decided upon. 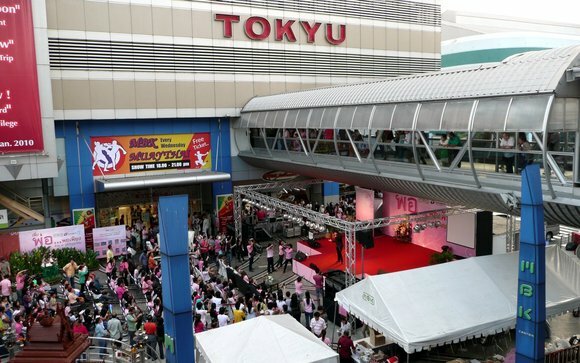 A concert at Tokyo department store at MBK shopping center. 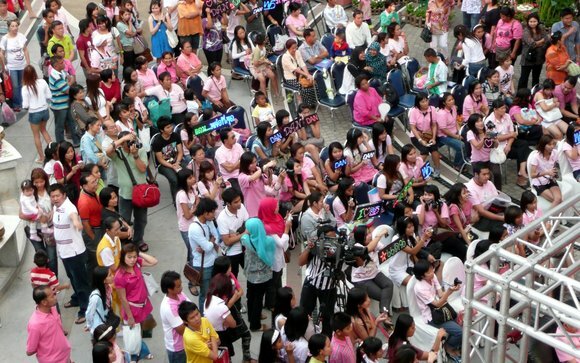 Note the prevalence of pink. The two-letter script that looks like “WO” in English is the Thai word for “father” – HMTK is affectionately referred to as the father of the nation. Father’s day coincides with his birthday. Here’s a closeup of the crowd watching the concern. I’ve never seen these LED signs before but I guess they are kind of a grown-up version of Lite Brite. I take it from these signs that the artist who is performing is known as Dan. 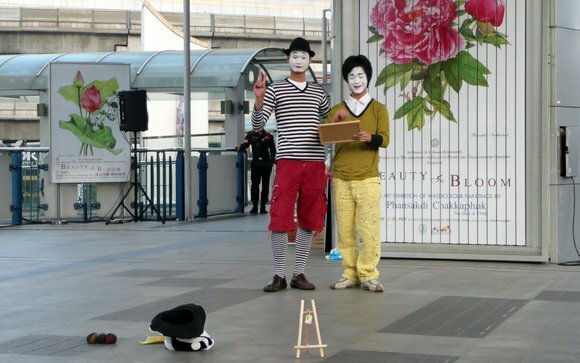 On the walkway from MBK shopping center to Siam Discovery, I saw something I have never seen before in Thailand and hope to never see again: mimes. Speaking of things you’ve never seen before. take a look at this picture and see if you can tell me what about it you’ve never seen before. Me wearing brown shoes. After some prodding from Tawn (and an amazing find of wide shoe sizes from Clarks, something else I’ve never seen in Thailand) I caved in and bought a brown pair of shoes. I have not owned brown shoes since maybe high school. In university I did have a pair of blue Doc Martens but other than that, my leather shoes (with the exception of sneakers) have been black. No confusion, no fuss, no trouble matching the belt. You may not fully appreciate how earth-shattering this news is, but you should know that snowballs are starting to feel like they have a fighting chance in hell. This entry was posted in Uncategorized and tagged Birthday, Fashion, King, Motorbikes, Odds and Ends, Trucks by christao408. Bookmark the permalink. The loaf looks perfect! Congratulations on mastering the art of bread making. ***The example is no different from Indian problem solving. ***If it wasn’t for the Thai written all over and how organized the traffic looks, I would have said that it was taken here. hehe ***I have never seen a mime ever! I don’t know if that is good or bad. ***If you were going to take a snap… you should have suited up. The denim is an absolute no – no with such a beautiful shoes (even for a random shot!)! Am pretty sure that Tawn would have said so too, perhaps? Definitely noticed the shoes right away. Just doesn’t quite look like you haha with the cap toes! I tried hard to move shinning away from wearing all black His excuse is that it’s easier to match other cloth, which are mostly black and I am also trying to move him away from.I got him a pair of blue shoes.Sandwich bread is amazing, but very under-appreciated/underwhelming since they are so common/cheap in grocery stores. I do admire you can create those though. You are a great baker.Do you have cold hands? I don’t get it – why do they swap the labels and serial numbers? I did notice the shoes too – it sort of stood out (the shine?). It looks good with the blue jeans. I noticed the shoe before reading the answer! Seems like a Tawn influence. Nice touch! Hey, now that pink color is in. You plan to try pink next? The overloaded vehicles kind of scare me. I would not want to drive behind one of those. I can imagine the boxes falling all over the brave soul that decides it is safe to drive behind them. I love your brown shoes! Noticed the shoes right away! It only took 10 years for Tawn to finally rub off on you! Thanks Tawn! @Dezinerdreams – Tawn was just happy to have me in brown shoes! As for everything else, have I shared the lengthy history of how Thailand has been culturally influenced by the Indians? =D@yang1815 – I’ve worn cap toes for a while, although usually only as dress shoes. @Wangium – I’d be right there with Shinning if it wasn’t for the horrid problem of lint on black clothing. How do New Yorkers do it? =D As for my hands, I don’t think they are particularly cold or particularly warm. @secade – Mimes in Seoul? Really? @arenadi – 1) I was hoping you would tell me, Mike! I think it creates a crisper crust and richer crumb, but am not entirely sure. @ElusiveWords – The change is so they can return the “new” unit they ordered to the manufacturer. I take the “display model” which they’ve already paid for and, I assume, they discontinue selling the model. That’s what I think but, really, who knows? @stevew918 – I’ll have you know that back in Junior High and High School, I did wear pink oxford shirts. @TheCheshireGrins – Notice that I took the picture from the next lane over. 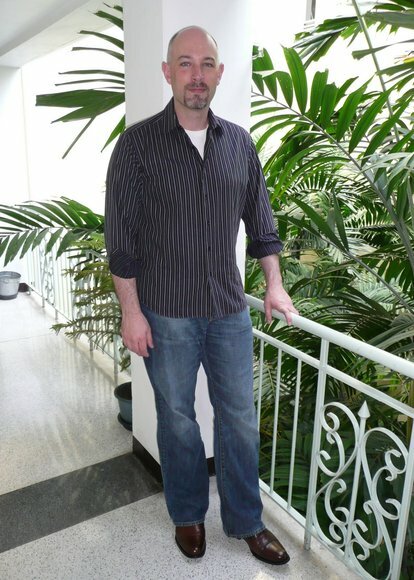 LOL@oldpartner – Yes, but I got Tawn to wear sneakers within just a few months of his move to the US. He’s quicker to change than I! @tehls – Nope. Not buying any brown belts. The untucked shirts work well for me since my hips are the widest part of my body! @christao408 – You have got to wear brown belt to match the brown shoes!!! wow.. that is a beautiful loaf of bread!i like your caption for the mime picture..hahahai didnt know the answer to the question but i did notice those shoes in the picture. they’re so shiny & really stand out! Brown shoes!!! What is this world coming to?! The overloaded vehicles reminded me of being in the Dominican Republic and seeing a pickup truck with a giant ball of empy plastic jugs filling the back and towering up; a marvel of physics, it was.I wasn’t sure what was different, but as soon as I looked at it, I thought those shoes looked nice and shiny. I like them! I noticed the shoes right away. Poor Tawn! What he has to put up with, hunh?? just kidding. Having not seen a full length photo of you before, nor really knowing you much…. I was at a loss. But the brown shoes look great. In fact, I prefer brown to black. Though I did get this weird in-between shade in my last pair of shoes that goes w/brown or black belts. There’s enough distance between the two not to be able to notice. Darn, can’t edit my entry. Was going to add:In India once, my taxi was side-swipped by an overloaded motorcycle coming at us carrying what looked to be six huge propane or oxygen tanks! I’m guessing they were empty – ’cause well, I’m here aren’t I? @everyday_yogi – I see those compressed gas cylinders on the back of motorbikes and wonder why there aren’t more explosions. @ZSA_MD – Yeah, he’s a saint. @epiginoskete – Guess I’ll have to keep ’em polished. @stebow – I know, huh? @iskrak – I’m glad nobody has blasted me for being un-PC for mimes. mwahaha that overloaded truck is ridiculous! And I’m with ya with the mimes. They’ve always been as scary as clowns for me growing up lol. @brooklyn2028 – Oddly, I could picture you in black jeans. Surprised that it isn’t the norm for you. @ungrandvoyage – Terrifyingly so. @Rm2046 – The way they load trucks here just makes me laugh. How much duct tape and twine can you use to secure a truck’s load? 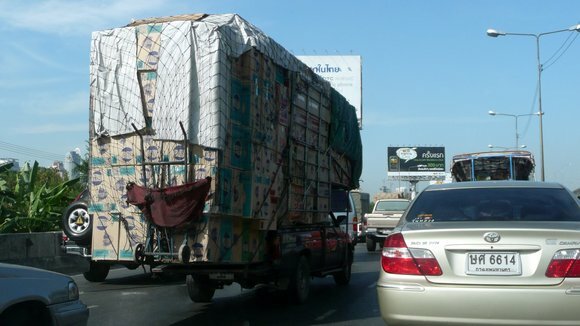 @lil_squirrel4ever – Four years on and I’m still amazed each time I see an overloaded vehicle.